Chinmaya Mission West organized a residential adults-only Sadhana Camp conducted by Pujya Mukhya Swami Swaroopananda at Krishnalaya, Piercy from July 8 to 13, 2017. About 40 campers attended the whole camp. The topic was “The Quietening” based on Ramana Maharshi’s Saddarshana. Guru Purnima was celebrated during the camp on July 9th with a puja conducted by Swami Shivatmananda. As Mukhya Swamiji explained, the topic is about gaining the vision of one’s own eternal nature which is the Truth and abiding in It. Mukhya Swamiji’s lucid explanations and his engaging style brought the subtle subject matter within easy comprehension of the campers. Swamiji’s hilarious interpretation of Pujya Gurudev’s electricity yoga didn’t just have the campers laughing – it shed light on the topic being discussed. Swami Shivatmananda, Resident Acharya, Austin, conducted the morning meditation class and supplemented Mukhya Swamiji’s discourses by expounded on the different methods for sadhana to help purify and prepare the mind for meditation, using Pujya Guruji’s text ‘Dhyanasvarupam’. Swami Advaitananda, Resident Acharya, San Jose, conducted soulful musical satsangs in the evening. In one of the satsangs, Swamiji detailed the journey of a seeker via different bhajans. 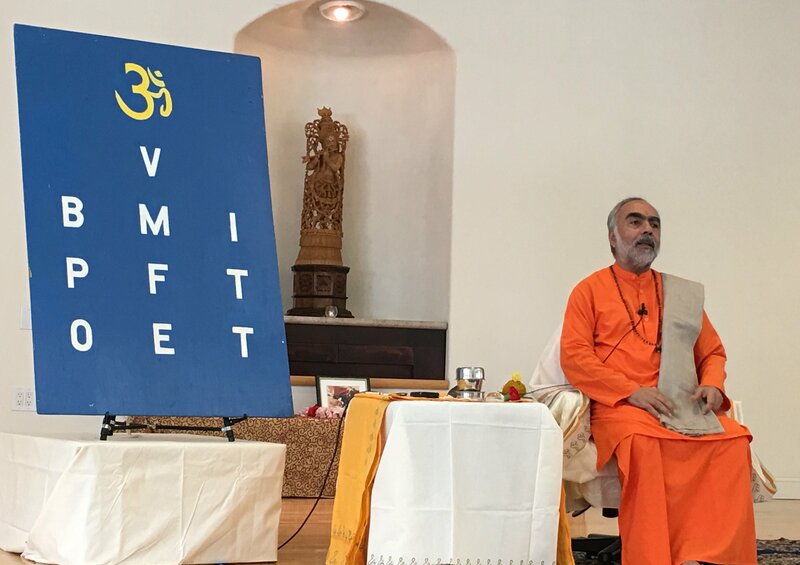 Swamiji’s unique style and use of acronyms were a hit with all (e.g. LIFE= Living Intelligently For Ever, GOAL = Getting Over All Limitations). Acharya Jayaji from Vancouver took one satsang in the evening and shared the meaning of Satsang and the impact and importance of being in the presence of Mahatmas. 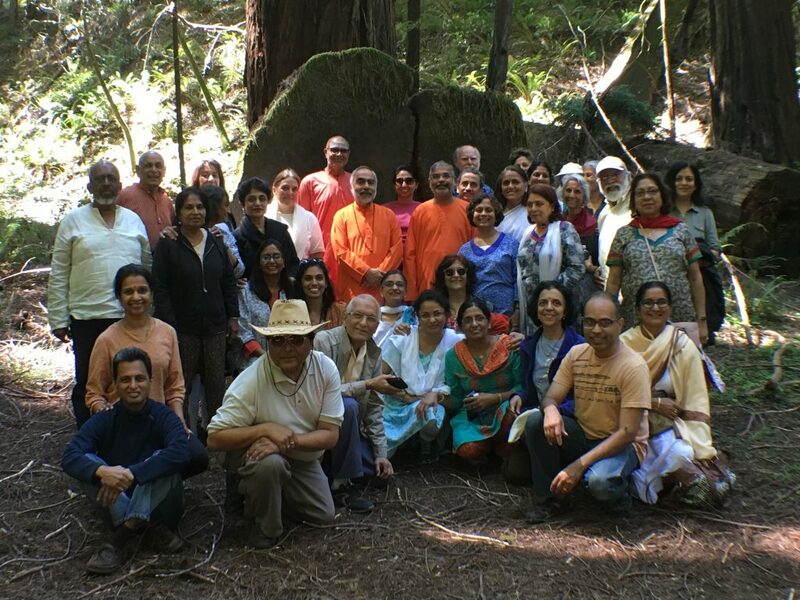 All the campers and acharyas went for a field trip to the Redwoods (Richardson Grove) to explore the serene redwoods, termed as rishis by Pujya Gurudev. Swami Shivatmananda led a group of campers into an area Gurudev had visited and together the campers sat in meditation. Mukhya Swamiji, who is known for His love of photography took some spectacular photographs of the tall redwoods and devotees. The delegates celebrated the last night of the camp with an amazing campfire with a lot of singing and delicious hot chocolate. Mukhya Swamiji reminisced about the time he spent with Pujya Gurudev and sang a touching song which He composed when he was a student in Sandeepany, Powai. Swamiji was joined by Acharya Robinji from Victoria, Canada in sharing the song with all of us. It was a memorable evening that is etched in our hearts forever. Everyone who attended the camp is already looking forward to Sadhana Camp 2018 with Mukhya Swamiji!